Prior to Opening Day, the Yankees hadn’t played in nearly six months. Sure, there were the morning workouts in spring training and the innings played here and there in exhibition games, but it had been nearly half a calendar year since their last real game. 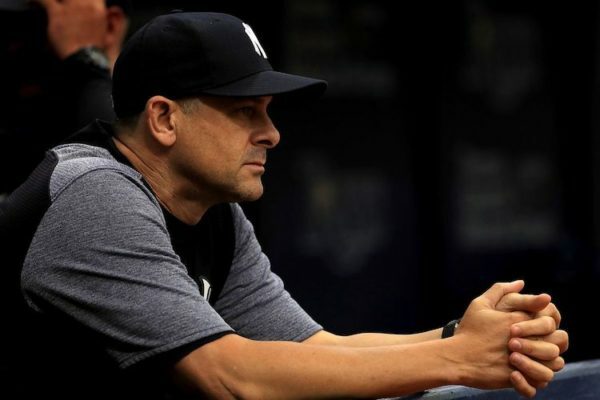 Despite not having played in six months, and despite it being the first week of the season, Aaron Boone and the Yankees believe players need their days off. Not the off days on the schedule, rather days off for individual players to reset after the grind of five games in the dog days of late March and early April. The Yankees have had three of the the last eight days off, and they will be off again on Friday. That’s a lot of time off after having already had the last six months off because of an early postseason exit. Boone decided being down 119 home runs from 2018 in his lineup wasn’t enough, so he had Gary Sanchez and Troy Tulowitzki on the bench as well. He picked Tuesday to give Tauchman the start in left field and have Frazier, Wade and Romine all make their season debuts, creating a formidable 6 through 9 in the order. Sanchez is a catcher and catchers need days off. But Sanchez also missed nearly half of last season and it’s the fifth game of the season. Does he really need a day off right given the schedule listed above? And if you need to give him a day off behind the plate, does he have to sit out completely? The American League created this lineup spot where you can have a player bat and not play the field called the designated hitter, which would have been a perfect spot for Sanchez on Tuesday, considering he homered on both Sunday and Monday and the Yankees’ need for major league bats in their lineup. But nope. Sanchez was out of the lineup completely. The scheduled off days last Friday and this Friday weren’t enough to allow him to walk to home plate and take four plate appearances. Tulowitzki homered in the ninth inning on Saturday and then was given the day off on Sunday. He played on Monday and was once again given the day off on Tuesday. On Opening Day it was reported the Yankees wouldn’t allow Tulowitzki to play in the field three days in a row, but here he was not only not playing in the field in two out of three games, but not playing at all. Why is there a rule about resting Tulowitzki? There’s no actual answer other than the Yankees believe they can prevent him from getting injured the same way they have kept Gregorius, Hicks, Stanton and Andujar healthy. Tulowitzki has had nearly two years off. He’s signed to a one-year deal at the league minimum and isn’t part of the team’s future. If he were to get hurt, it wouldn’t disrupt the team’s plans in any way. Yet here they are protecting him as if he’s their shortstop for the next five years. It should come as no surprise Tulowitzki’s ninth-inning home run on Saturday wasn’t enough to get him in the lineup on Sunday and Sanchez’s home runs on Sunday and Monday weren’t enough for him to at least be the DH on Tuesday. Boone doesn’t believe in “being hot”. He said so last August. He doesn’t care if a player goes 4-for-4 with three home runs, seven RBIs and two walks. If that player’s scheduled day off is the next game, that player isn’t in the lineup the next game. It’s unclear why the Yankees believe they have figured out who needs days off and when they need them or why they truly think they have the solution to preventing injuries and maximizing performance. They currently have more players on the injured list than any other team in baseball and they haven’t won anything in a decade. Guess what? Injuries happen and there’s nothing you can do about them. Having scheduled off days won’t prevent a player from pulling an oblique in the next game or jamming their shoulder sliding back to third a week later. Pulling a starting pitcher after 85 pitches doesn’t mean he won’t tear his elbow on the first pitch of his next start and not using a reliever three days in a row doesn’t mean he won’t land on the injured list at some point anyway. There’s absolutely nothing that can be done to prevent injuries and there’s no exact amount of rest which will help players perform over the course of a season and in the postseason. The Yankees should know this better than any team. The Yankees scored one run over nine innings in an eventual 3-1 loss on Tuesday with Boone’s spring training road trip lineup collecting six hits. Two hours and 41 minutes wasted watching an outcome I expected when the lineup was posted. Once again, these five games aren’t a small sample size. They are a continuation of the 2018 season, which we are now 172 games into. I have no idea why I thought a six-month break would magically change things for the same exact roster. And I really have no idea why I thought Boone would be any different in his second year than he was in his first in any aspect of his managing, whether it be lineup construction, bullpen management or something as simple as not allowing Tauchman to bat in the ninth down by two runs with Sanchez and Tulowitzki on the bench. So much for the urgency Aaron Judge spoke about after Saturday’s embarrassing loss. The “2019 Yankees” are now 2-3 against the Orioles and Tigers, two teams which will finish in last place in their respective divisions. I’m looking forward to seeing which players have scheduled days off on Wednesday and Thursday.